U.S. Sen. Mark R. Warner (D-VA) also released the following statement: “Today’s news is devastating. Sexual assault is never acceptable, and survivors of violence and harassment deserve to be heard. ​If these allegations concerning Lieutenant Governor Fairfax are accurate, then they are clearly disqualifying and he must resign. U.S. Sen. Tim Kaine of Virginia is calling on Lt. Gov. 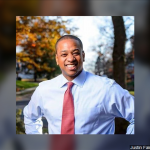 Justin Fairfax to resign after two women went public with allegations of sexual assault against Fairfax.